Writing for Vestibule has transforme me in a deco monster ! I've always loved to change the style of my rooms, move the furniture around, change decor items. But since writing for this blog, I've been finding more stuff to do in my own apartment. Let me tell you that my wallet has lost a few leaves over this ! #1 - Never underestimate the power of new towels ! Plus, we are loving fringes on everything right now. #2 - A new shower curtain can go a long way. A simple step that can totally transform the look of a bathroom. You only have to choose if you want to go more minimalistic or more colorful. 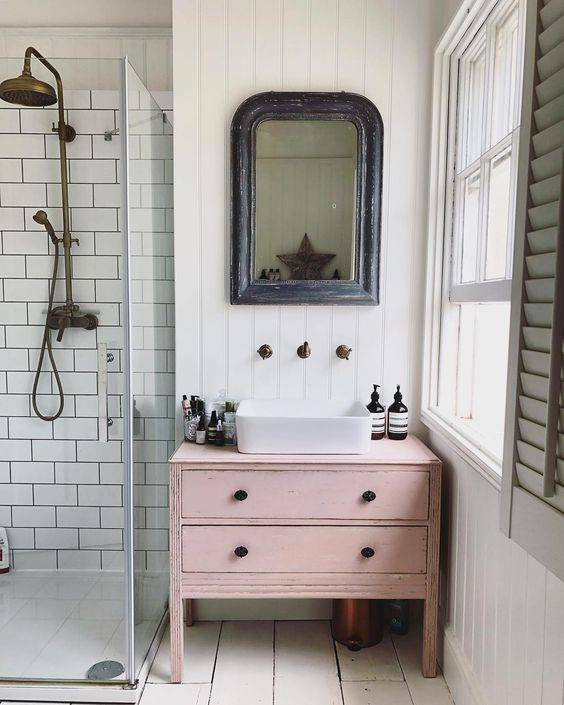 #3 - Paint the vanity to give it a new life. Dare to go black to make a statement or opt for a pastel color for a softer look. #4 - Replace your pharmacy for a statement mirror that will instantly change the whole appearance of your room and make it more special. #5 - Change up your basic, and kind of ugly, bath rug for a one that is way more stylish. I've been gushing over marocain and jute ones ! #6 - Add life and greenery with a few plants ! Eucalyptus is a must, it will leave your bathroom smelling like a spa and it is so pretty and timeless. #7 - Hang art on your walls. It will infuse a lot of personality into this room. A few framed posters or a big canvas is all your need. #8 - Wallpaper can make your room become a whole statement in itself. It is trendy right now, so you'll be sure to find a nice one that will please your tastes. #9 - Change up the light fixtures, shower rods and towel rails. Small accessories, big change ! Leave the chrome finish behind and opt for brass of black. #10 - Embellish the room with nice candles. Not only do they smell good, but they offer diffuse lighting to create a relaxing space for your self-care moments in the bathtub.